Agent 4 is the role the player assumes in Octo Canyon, assigned by Marie. Agent 4 can have a variety of appearances, depending on the player's choice of gender, skin color, eye color, and hairstyle, as well as their current ink color. They wear the new version of the Hero Suit and can pick up armor to wear as well. They wield the Hero Shot by default but are later able to use a variety of other Hero weapons given to them by Sheldon. No matter what the player is wearing, when Agent 4 enters Octo Canyon for the first time, they wear the White Headband, Basic Tee, and Cream Basics before shortly getting changed into the Hero Suit. Agent 4 initially went to Inkopolis for an unknown reason but got swept up in Marie's quest to save the Great Zapfish and her cousin Callie. In Octo Canyon, Agent 4 completes various missions to retrieve stolen Zapfish, defeating many Octarians along the way. Eventually, Agent 4 confronts DJ Octavio and a brainwashed Callie, rescuing the Great Zapfish, freeing Callie, and finally restoring Inkopolis' power supply. Similar to how Agent 3 is called so by Captain Cuttlefish because Agents 1 and 2 are Callie and Marie, Agent 4's name is given by Marie in continuation of Agent 1 (Callie), Agent 2 (Marie), and Agent 3 (the player in Splatoon). Once again, the player's real name is never revealed. Based on Marie's dialogue stating that Agent 4 is "two years older" than Agent 3, one can assume that Agent 4 is at least 18 years old, as Agent 3 was about 14 years old around the events of Splatoon, and would be around 16 years old during the events of Splatoon 2. This has been a topic of confusion and debate within the community, with many believing Agent 4 to still be 14, noting the Inklings' similar physical appearance to those of the first game. Marie's statements which would make Agent 4 roughly 18 years old also contradict a statement made in an interview with Splatoon 2 producer Hisashi Nogami that "The previous playable Inklings would be around 16 now, so the new 14-year-old Inklings will step up to the plate. The playable Inklings will still be around 14." It is unknown if this is an oversight or not. It has also been suggested that Marie's dialogue is a meta-joke, directed not towards Agent 4, but towards the player who controls Agent 4 themselves. In Japanese version, Marie didn't mention about Agent 4's age. 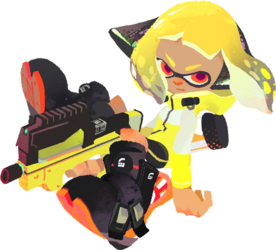 Most promotional artwork and screenshots depict Agent 4's gender and appearance to be that of a female Inkling with short yellow tentacles, although some concept art and a segment of the credits depicted a male agent 4. This is less variable than the first game, which had multiple official artworks depicting both female and male Inklings as Agent 3. This is further evidenced by the final portion of the end credits, which depict a female Agent 4 celebrating alongside a reunited Callie and Marie. The only appearance of a male Agent 4 is one with slicked-back tentacles but no known color due to being in the credits segment. One of Marie's dialogues when spoken to in Octo Canyon reveals that she finds Agent 4 to be "pretty adorable". She also states that Agent 4 has much better hygiene than Agent 3. Agent 4's ink color varies based on the mission, while it is also a specific color depending on each sector of Octo Canyon. They have yellow ink in Sector 1, green ink in Sectors 2 and 5, and teal ink in Sectors 3 and 4. A female Inkling on artwork for Tower Records has the same features commonly used for Agent 4. She is seen with an Octoling that resembles Agent 8, implying it could be both of them. Agent 4 is nicknamed "Four" by Marie. The official Splatoon 2 relationship chart implies that Agent 4 does not watch TV, which may explain why they stood in awkward silence when Marie brought up the subject of her fame. Agent 4 with the Hero Dualies. A promo poster with Agent 4. A doodle of Agent 4 appearing at the top-left corner during the credits. A doodle of a male and female Agent 4 during the credits. This page was last edited on 16 April 2019, at 07:17. This page has been accessed 115,263 times.